Philip Tyler is a British artist who focuses on the materiality of paint and its potential to create illusionary spaces on the canvas. The artist works in a host of mediums, including painting, drawing, printmaking, photography and collage. Tyler embraces multiple themes, such as exploring the emotions of loss. The artist is a Fine Art graduate from Loughborough University and followed up his degree with an MA from the University of Brighton.…Show more His artwork has been exhibited both nationally and internationally. 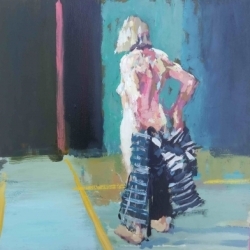 Some of these shows include the the ING Discerning Eye, the Royal Institute of Oil Painters, The Lynn Painter-Stainers prize and The Garrick Milne Prize.